June 28th is National Ceviche Day, honoring one of our favorite foods. If you’re a sashimi lover and haven’t tried ceviche, today’s the day. Another reason to eat lots of ceviche: It’s a low calorie, good-for you lunch or first course. And it’s been nourishing man since ancient times. Ceviche—shellfish cured by acidic citrus juice—has been popular in Latin America for many centuries. In the early 1500s, the Spanish conquistadors wrote of an Inca dish of raw fish marinated in chicha, a fermented maize beer that dates back some 2,000 years. The concept evolved into ceviche (pronounced say-VEE-chay), raw fish or shellfish cured with citrus juice. A chemical process occurs when the fish/shellfish is marinated in the highly acidic citrus juice, which denatures the protein. The result is similar to what happens when the fish is cooked with heat. Instead of “cooking,” however, the fish is cured in the marinade, which adds its own delicious flavors. Both Ecuador and Peru claim to have originated ceviche; both were part of the Incan Empire. But why quibble: Today, ceviche—or seviche or sebiche, depending on the country—is so popular that there are cevicherias, restaurants that specialize in ceviche. 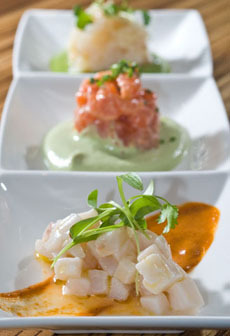 A trio of different ceviches. Photo © James Camp | Dreamstime. The Spanish brought the lime and onion that are integral to modern ceviche. In fact, the term “ceviche” is thought to come from the Spanish escabeche, meaning marinade. Others argue that the word comes from the Quechua (Incan) word siwichi—although we could not find this word in the Quechua dictionary we consulted. Ecuadorian ceviche is served with popcorn. Mexican ceviche includes a dice of onion and tomato—popular ingredient of salsa fresca. Traditional seasonings include chili powder, onions, garlic, cilantro and a little sea salt. Mackerel ceviche is popular, as are red snapper, sole and striped bass. Panamanian ceviche includes hot sauce and is served with saltines. Peruvian ceviche combines shrimp with native sweet potatoes and/or yucca, plus onion and the native aji amarillo chile. Cancha, large and crunchy Andean corn kernels that have been toasted and salted (i.e., corn nuts), are also added. The ingredients are marinated in the juice of a Peruvian lemon related to the Key lime. Ceviche is considered to be the national dish of Peru. California style: ceviche in an avocado half. Photo courtesy Avocados From Mexico. 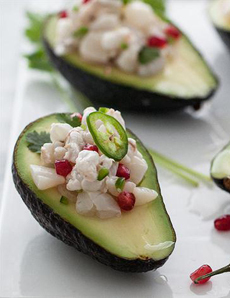 But this year for National Ceviche Day, we’re going California style, adding ceviche to the well of an avocado. If you prefer fish to seafood, try this variation, stuffed with red snapper ceviche or tuna ceviche. If you’re wary of raw fish (even cured raw fish), try this shrimp ceviche recipe. 1. CHOP shrimp and scallops into large, diced pieces and add to a large bowl. Add jalapeño, shallots and lime juice and stir well to coat. Season with kosher salt and cover and refrigerate for 1 hour for flavors to meld. 2. ADD cilantro and pomegranate seeds and mix. 3. TO SERVE: Prepare avocado halves and divide ceviche evenly among them. Garnish with cilantro leaves and sliced jalapeño or serrano peppers. Here’s a template to create your ideal ceviche recipe. What to drink with ceviche.